Terrence Jones hadn’t played one meaningful minute all year, then he helped lead the Rockets to a 110-104 win over Toronto. Terrence Jones entered Monday’s game against Toronto with a whopping 15 minutes played in the first seven regular season games combined, all in mop-up duty. Once considered the favorite for Houston’s starting power forward spot, a strong preseason from Omri Casspi coupled with a desire to experiment with Omer Asik alongside Dwight Howard pushed Jones out of the rotation entirely. 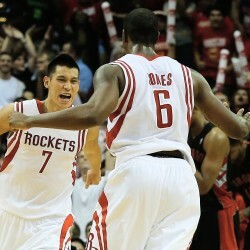 Terrence Jones wasn’t sure when his first significant regular-season minutes would come, but he proved ready to play. But with reserve swingman Francisco Garcia out with the flu, the Rockets (5-3) had minutes to fill, and the second-year power forward from Kentucky took full advantage. In 32 minutes, Jones collected 10 rebounds and blocked four shots on the interior, in addition to playing excellent perimeter defense down the stretch against Rudy Gay (who shot 11-of-37 from the field — below 30%). Oh, and his 7 points on offense included the go-ahead basket with the game tied in double overtime, 104-104, with barely over a minute left. Despite not playing a single meaningful minute to begin the season, head coach Kevin McHale trusted Jones enough that he played every second of two overtimes — and that confidence paid off in Houston’s 110-104 win over the Raptors. Against a Toronto team that started the athletic Amir Johnson and Gay at the forward spots, Jones’ versatility and transition skills proved critical. At one point late in the game, with McHale wanting Jeremy Lin and Patrick Beverley to both play for ballhandling, the Rockets removed Chandler Parsons from the lineup (to make room) and not Jones. Casspi was still the first big man off the Houston bench, replacing Asik with about six minutes remaining in the first quarter, as he usually does. But with two minutes left in the opening frame, Jones entered the game in place of Parsons, pushing Casspi to the small forward spot. The Rockets bumped their lead from three to 10 almost immediately, and Jones was rewarded with a spot in the starting lineup for the second half (replacing Asik). It marked the first half of the 2013-14 season in which Asik did not start, and McHale said following the game that he was only “50/50” regarding the Asik/Howard lineup going forward. Should the two-center experiment ultimately fail, the debate has been whether Jones, Motiejunas or Greg Smith would be the first spare Houston big man to earn significant playing time alongside Howard. It turned out Jones was first in line, and he made the most of his initial opportunity. Garcia is likely to return when the Rockets play in Philadelphia on Wednesday night. But with Casspi nursing a strained left knee ligament and results from the Howard/Asik pairing mixed at best, Jones should have every opportunity to hold his rotation spot going forward.